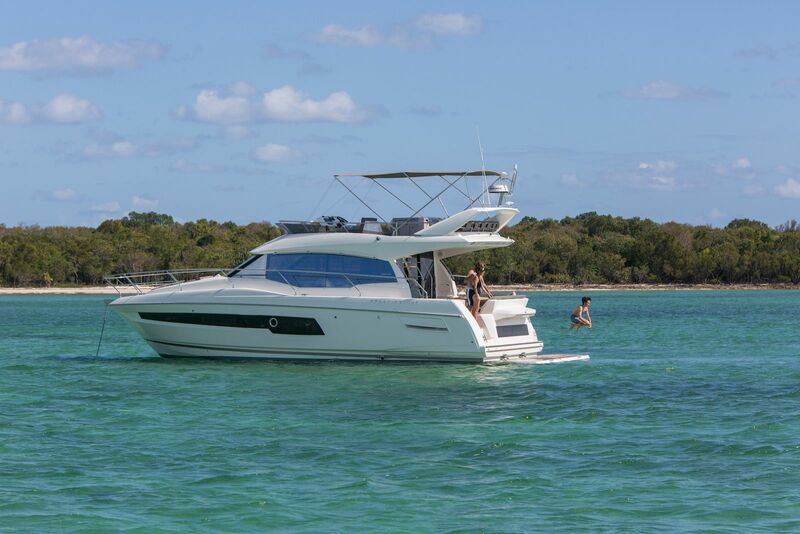 The Prestige Flybridge line is arguably the most sought-after brand of Flybridge models. 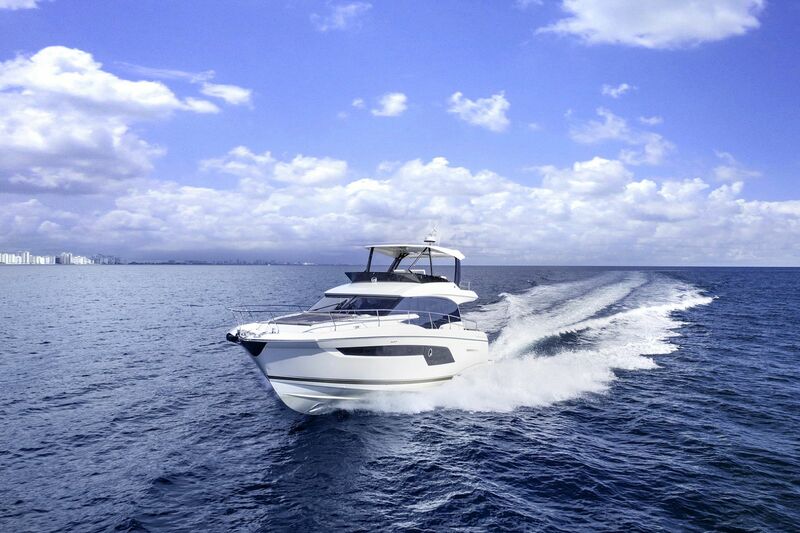 From the previous 40's to the brand-new Prestige 590 Fly and even the Yachts Division, the way the developers and engineers along with technology have designed a simplistic, effective and certainly beautiful flybridge is to be desired. 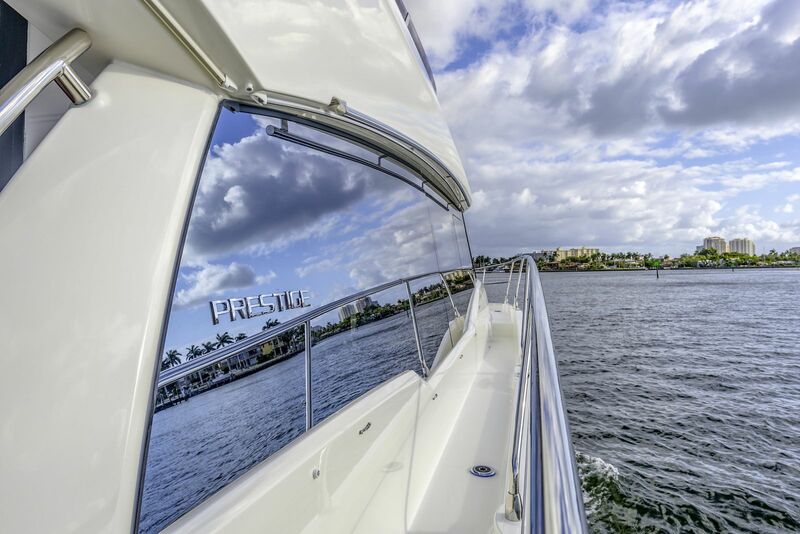 PRESTIGE is one of the first boat builders to design lighter, more spacious, more dependable, and more comfortable yachts by adopting Pod propulsion systems. 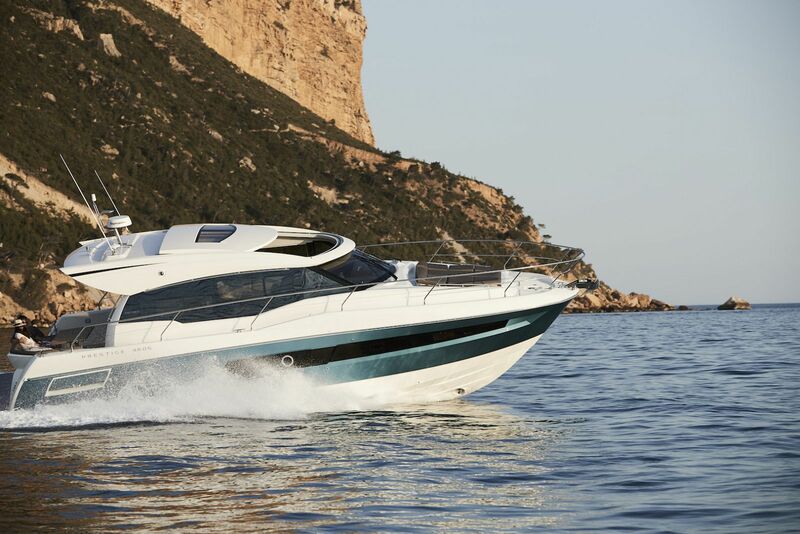 This has revolutionized life on board in terms of efficiency, ease of handling, noise and vibration, all thanks to the finely tapered, V-shaped, planing hull and engines placed slightly forward for optimum weight distribution. Latest in automated robots and cutting-edge technologies are used to ensure the production process is always the same and maintain the highest level of quality standards from the smallest to largest vessels. This process gives you piece of mind in your product and adds to the resale value when you are ready to move up. 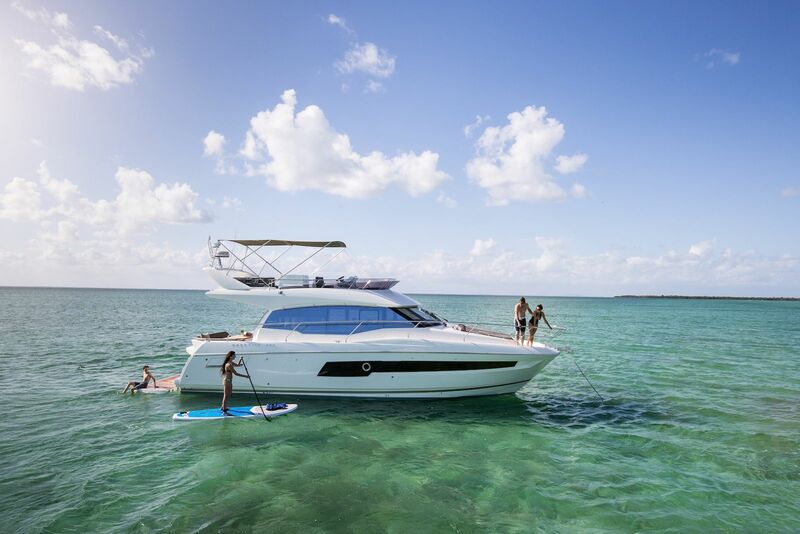 The Prestige 460 Fly is distinguished by her powerful hull and elegant flybridge designed to be as functional as it eye catching. 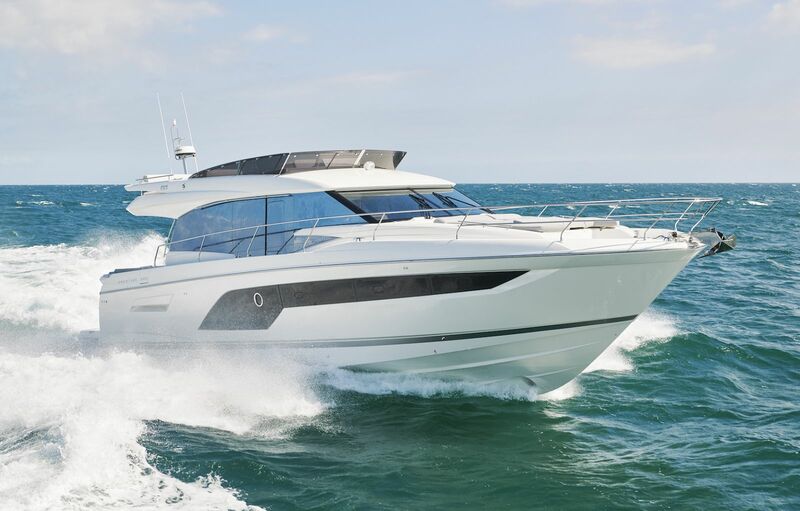 With her generous interior volume, and massive mirrored glass windows, the Prestige 460 Fly lends herself to easy, enjoyable entertainment. The look is meant to be admired and that it will. 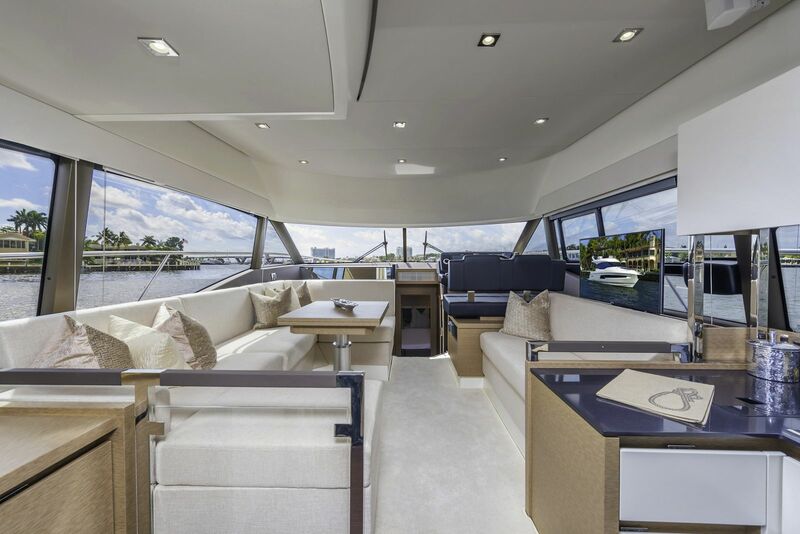 On the exterior, she features the signature style of the latest Prestige Yachts, with an expanded, continuous line of windows in the hull. 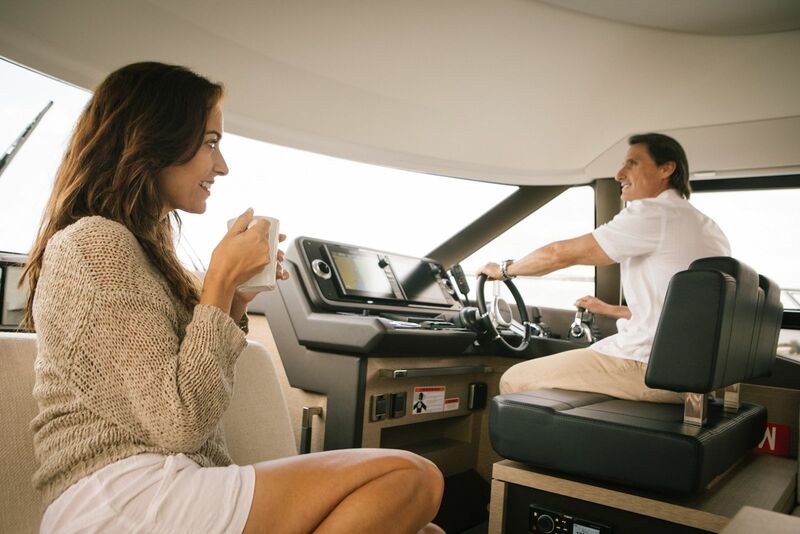 This Flybridge integrates the concept of the L-shaped cockpit, which allows for maximum use of space. 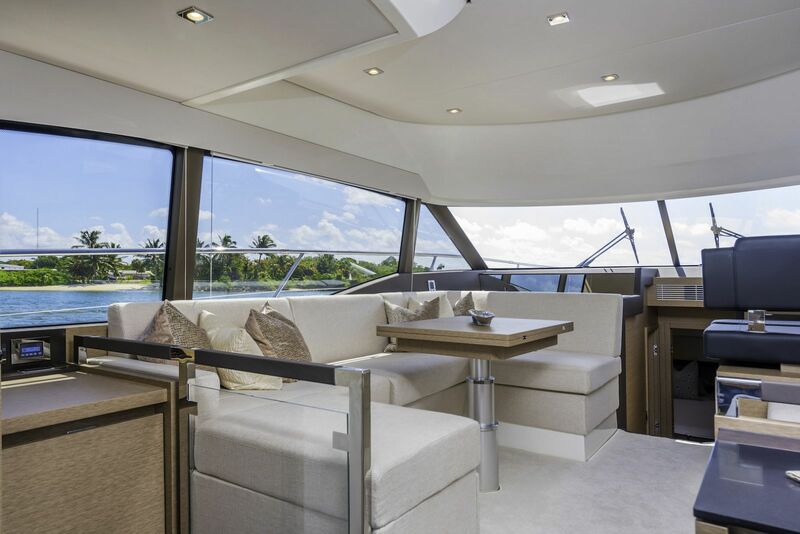 Transformable into a very large aft sundeck, this cockpit can also house an optional fully equipped skipper cabin. 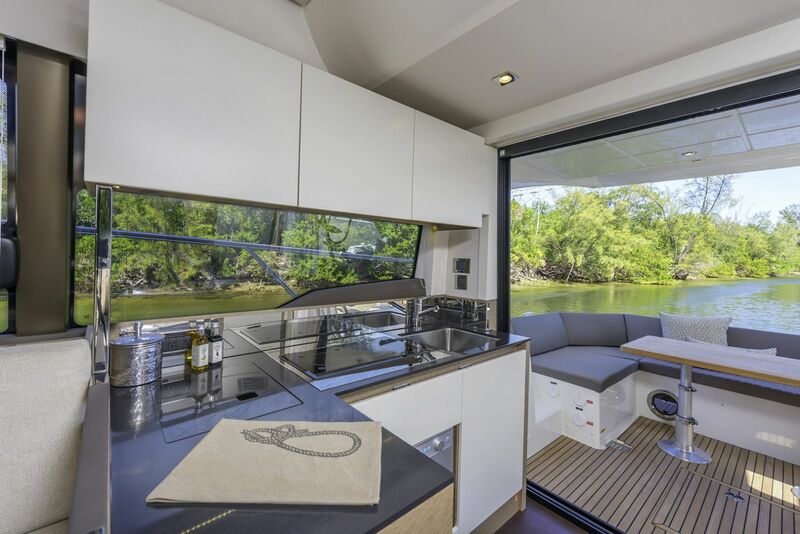 The contemporary layout of the exterior galley located to the aft opens onto an immense swim platform. 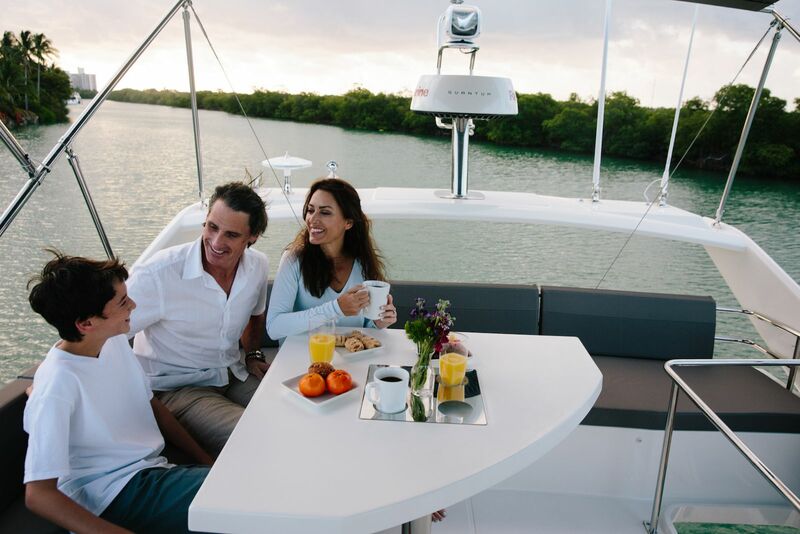 The very comfortable Flybridge is an invitation to complete relaxation. 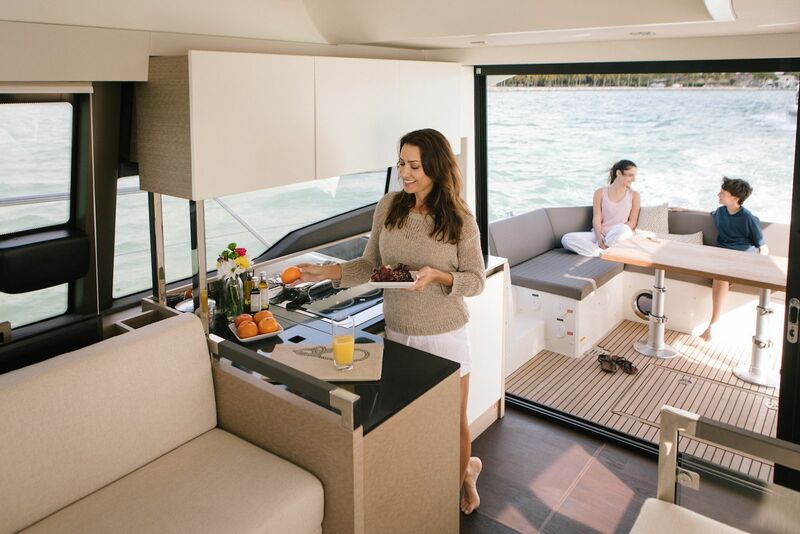 2019 changes bring an optional hard top for the Prestige 460 Fly which is exciting and will make the Flybridge even more desirable. 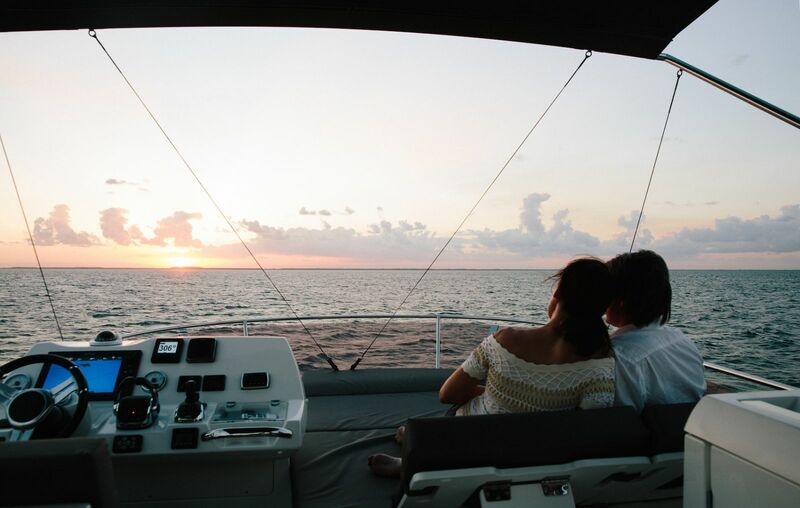 Captaining the vessel from the Fly is as enjoyable as it is breathtaking. The views one has from here whether at the dock or underway are usually photo worthy. The amount of sunpads onboard give the women plenty of options when choosing where to lay out for the rays. Two on the fly, one at the cockpit and a huge sunpad on the bow all flow smoothly with the lines and are actually comfortable. Stainless steel grab rails coupled with the extra wide walkways towards the bow make moving around the vessel safe and easy. 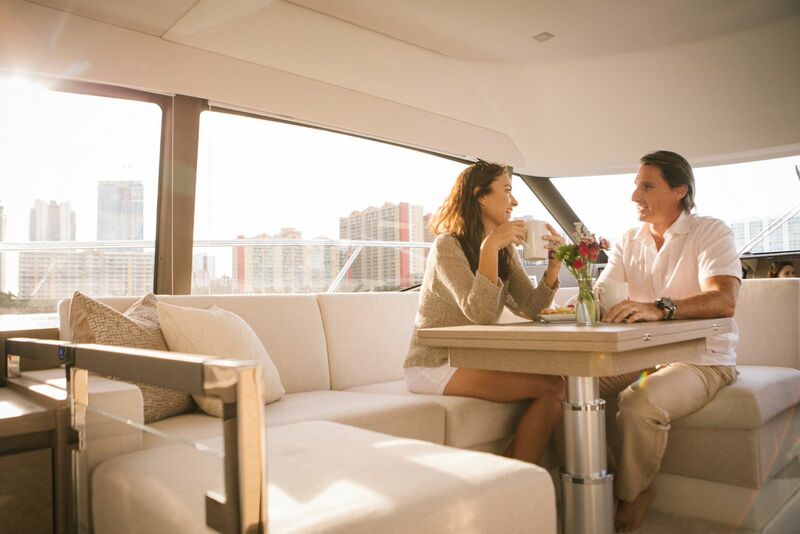 On board, everything has been optimized to offer unequalled space and comfort. 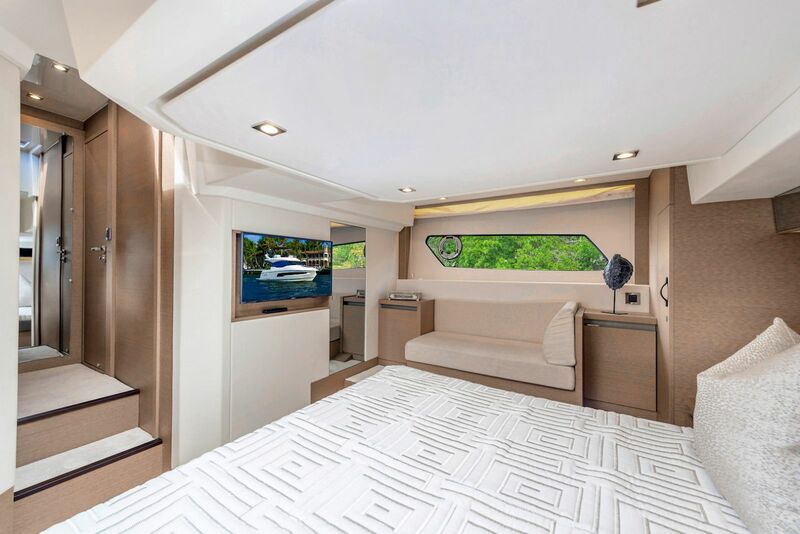 Combining the design talents of Garroni Design and JP Concepts, this Flybridge meets all the latest requirements and boasts all the benefits of a true Prestige Yacht. 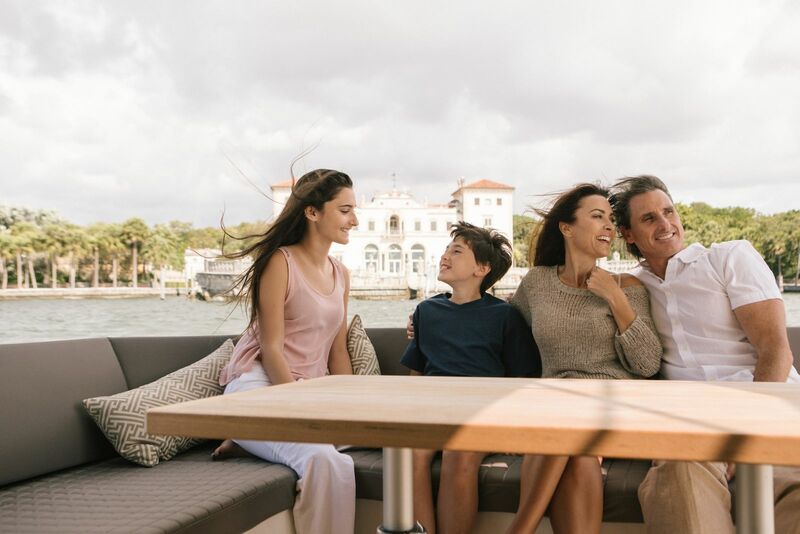 Optional two or three stateroom layout opens the door that was previously unavailable for larger families to own a 46 foot vessel and still have plenty of room. 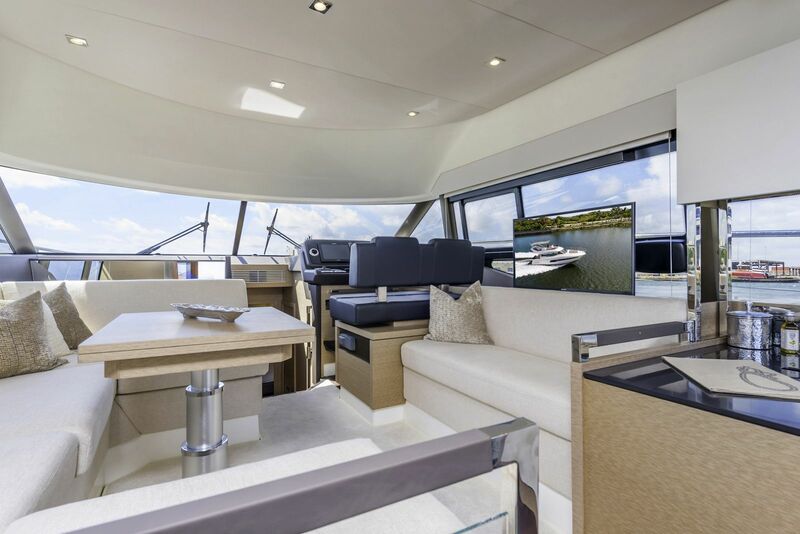 As with most of the Prestige models, the entrance is through three sliding glass doors which stack up to give access straight from the galley to the cockpit. With the light that floods the cabin everything feel massive. 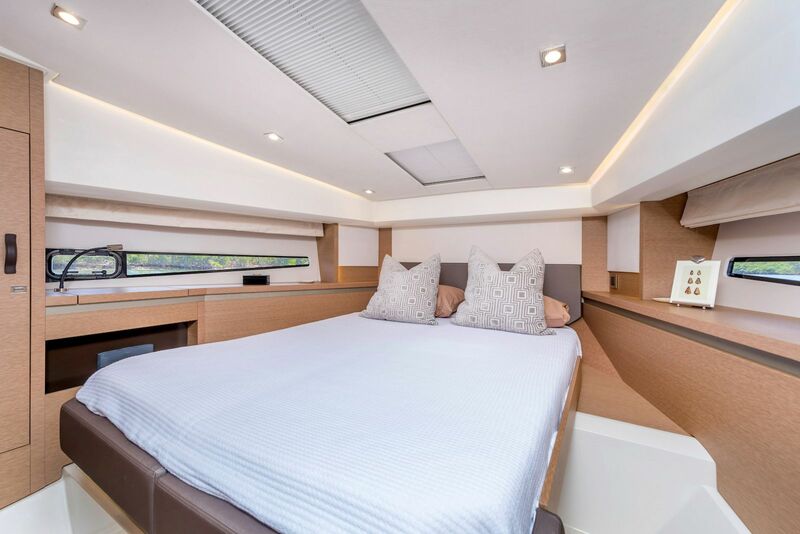 It is soon forgotten that it she is only a 46-foot yacht because the layout and use of space is something we are accustomed to seeing in a 50 plus footer. 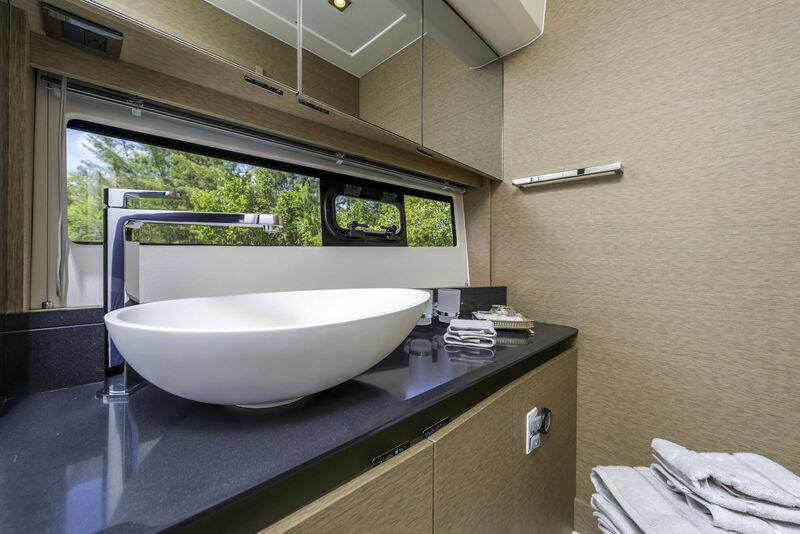 Enclosing more space inside a compact exterior, making top performance perfectly sure... PRESTIGE transforms the complex into the very simple and reinvents life at sea. A unique layout and design concept features noble materials to accent bright, generous interior volumes. 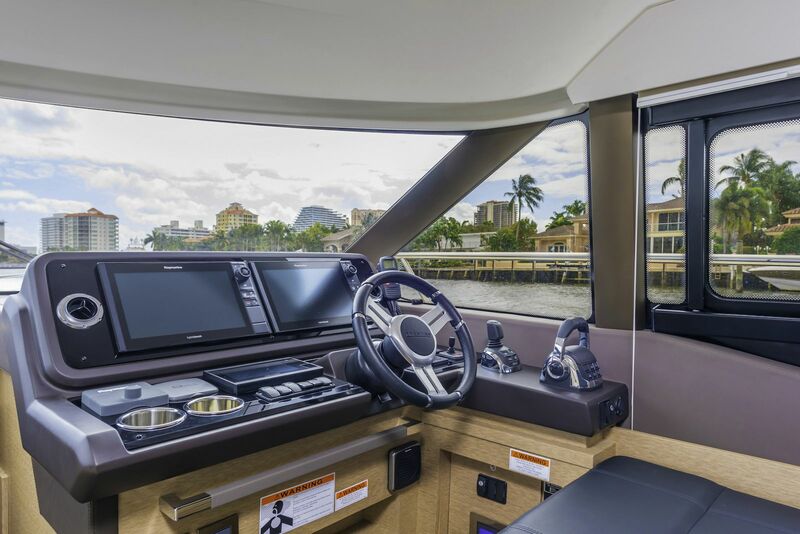 At the helm, it screams industrial luxury with the twin screens, leather captain's chair, joystick, private A/C vents and uncompromised visability. 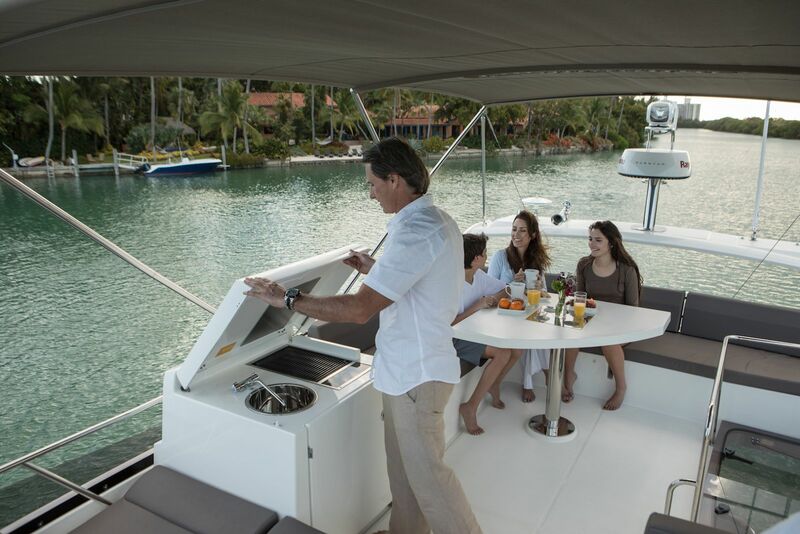 Bow thrusters coupled with the joystick technology makes for the maneuverability and handling of a much smaller vessel.There is also an optional second helm station aft in the cockpit which makes docking as simple and smooth as possible. 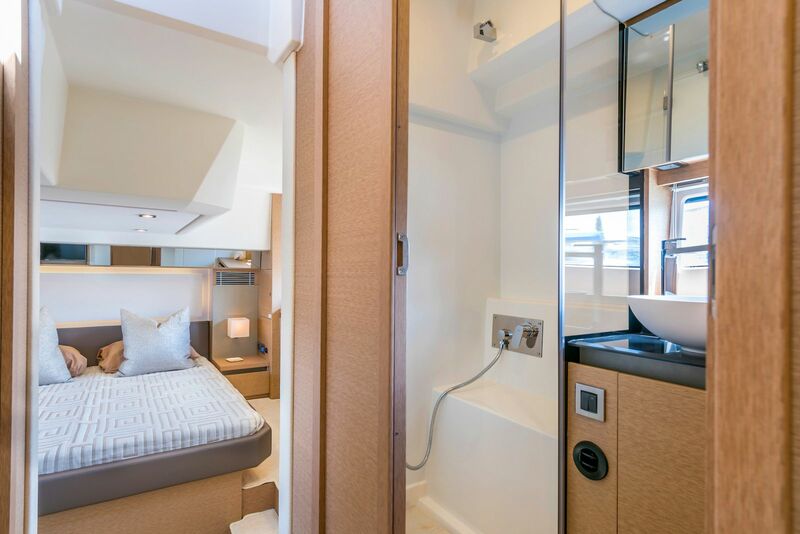 If the optional third stateroom layout (available on 2019 models) is more the style that would suit, there are two additional twin birth guest rooms that replace the master in the standard layout. 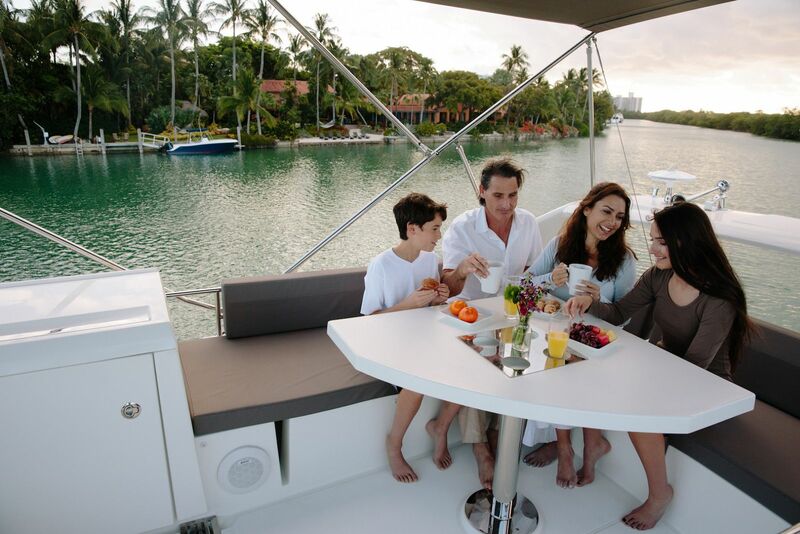 The VIP stateroom becomes the master in this situation which the owners at the bow of the boat. A bit of storage is sacrificed but only at the cost of an additional bed. 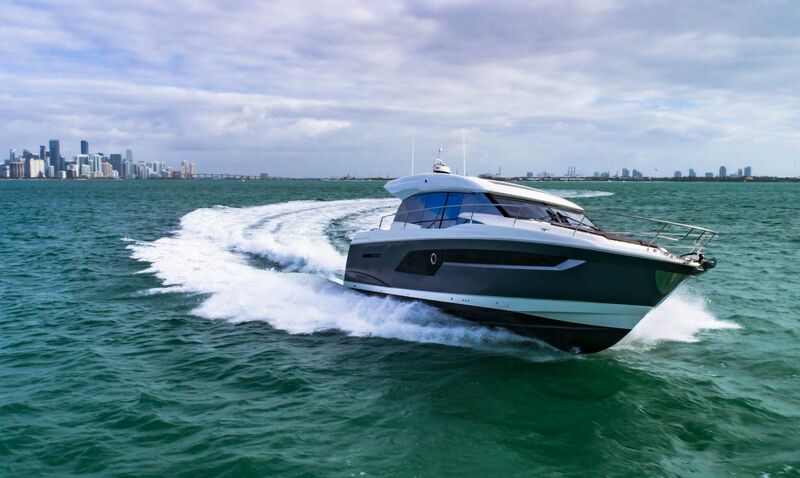 BoatTest.com puts the new Prestige Yachts 460 Flybridge through its paces and reports their findings. 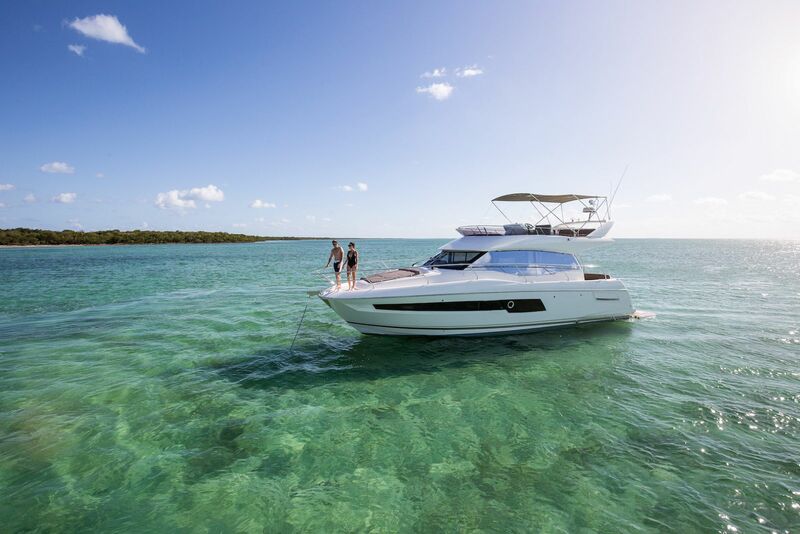 Power and Motor Yacht magazine reviews the new Prestige Yachts 460 Flybridge. How will you use your 460 Fly? 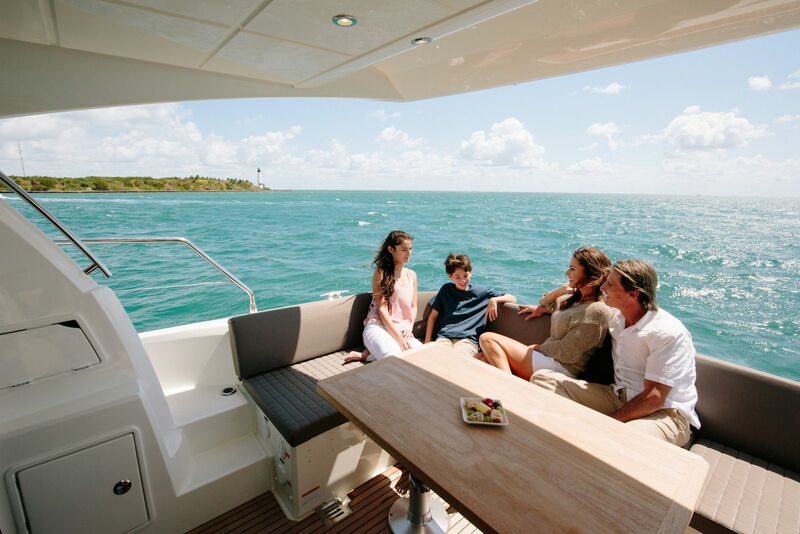 Prestige Yachts puts together this video trailer for the flybridge.